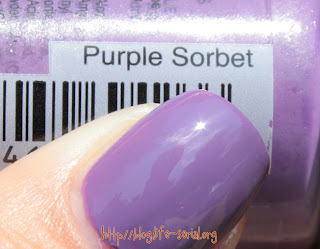 The one with Salon Perfect Purple Sorbet! Today I'm going out with some friends for lunch! I'm super excited about it...I haven't seen these girls in a while, and it's always wonderful to catch up with friends. Oh man...today's polish looks like one of my favorite purple cremes! Today's featured polish is Salon Perfect Purple Sorbet, a creamy grape-y purple. This is just a gorgeous shade of purple! It's simply beautiful. I hope to wear this one many, many more times.